Adams Extract & Spice LLC currently produces well over 100 extracts, spices, and food colors in a variety of sizes, but the company will always be best known for its vanilla extract, Adams Best. Adams Extract traces it beginnings back to 1888 when John Anderson Adams sold extracts in the harsh Michigan climate. In 1905 he moved his family to Texas. At the time, most vanilla was sold to pharmacies and was often labeled “Do not bake or freeze.” John A. Adams, a pharmacist whose imagination was stirred by his wife’s yearning for a flavoring that wouldn’t bake or freeze out, announced that he could produce a better vanilla than the one his wife was currently using. Working with just $6.71 worth of materials on top of an old icebox, Adams discovered the formula he wanted. To test this product, his wife whipped up a cake for the family to try. “John, this is the BEST flavoring I have ever used,” she announced. “Well, that’s old man Adams BEST,” he responded. The name stuck. The double-strength extract was sold door-to-door by sons Fred and Don. At night, by the light of kerosene lamps, the boys helped their father print labels. The first bottle of Adams Best vanilla was sold with the guarantee that if it was not the best vanilla extract the customer had ever used, the company would refund their money, even if the whole bottle was used. Shortly after World War II, Adams Extract began diversifying its product line and expanding its operations. By the early 1960s a spice division was added. In 2002 Adams Extract was moved to Gonzales, TX under its new name of Adams Extract & Spice LLC. Adams Extract & Spice LLC is a full service ingredient company that services a huge array of end users in the food industry under the Adams, CTI, Rex, Neustra Casa and Flavor a la Carte labels. From a ¼ oz. food coloring bottle in a grocery store to a container of raw spices for a multi-million dollar meat plant, Adams Extract & Spice LLC continues to produce the finest extracts and spices. Your family will love this one. The cake mix makes this quick and easy to put together. You may use any cake mix that you and your family like. The cookies came out good. They are soft and chewy. The cookies will keep for a few days, but they never last that long in my home. Use your creativity and play around with this recipe, have fun. When you try this recipe, come back and leave a comment. Let me know how you changed this recipe. In mixing bowl, add first 5 ingredients, mix well. Fold in peanut butter chips. Drop batter by spoonful on lightly greased sheet pan. Bake for 8 to 10 minutes, until set in center. Allow cookies to cool on sheet pan for 5 minutes before moving to cooling rack. Enjoy! Note: If you don't allow the cookies to cool on sheet pan for 5 minutes before moving to cooling rack, your cookies will break into pieces. YUM! 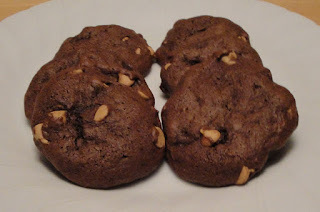 This is what I like to see -- simple yet delicious chocolate cookies. Those cookies look perfect! Yum! Very interesting read about the spice company. These chocolate peanut butter chip cookies sound AMAZING...my kids will surely enjoy when I made one for them. That looks yummy , Christine ! Did not realize that Adams was located in Gonzales TX! Good to know. I have some Reese's chips in the fridge and this looks like a tasty way to make use of them. these look delicious...thanks for sharing! Thanks everybody for your time and comments. I did not know the vanilla story--I love that you always give us some history! The cookies look amazing. These look tasty, I have never seen peanut butter chips but then I am definitely no baker, but I do like to eat them when someone else makes them. Happy day to you. Chocolate, peanut butter, and cookies. My favorite things!! These look great! Mmm I love the chocolate/PB combination and this looks like a fantastic take on it! That looks yummy, love it! I love peanut butter and chocolate, so these cookies have my name on them, They look so good! Perfect combo. Love chocolate and peanut butter together.